Cabbage Hill on I-84 in Oregon, east of Pendleton. The Oregon Department of Transportation, in their brochure urging drivers to "Respect The Hill!" 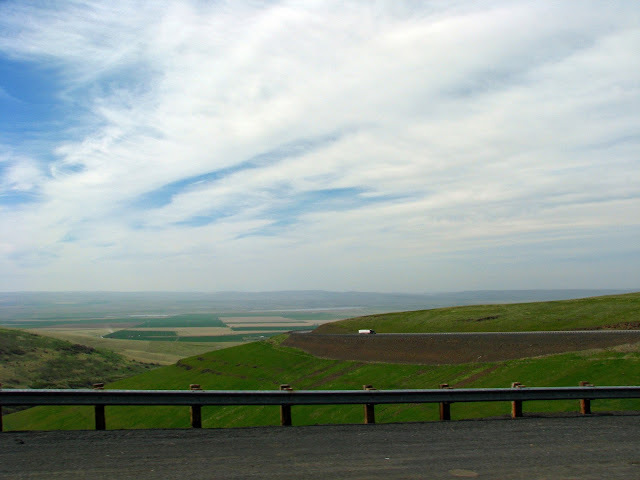 says, "Emigrant Hill, commonly called “Cabbage Hill” is one of the most hazardous stretches of road along westbound Interstate 84. This seven-mile downgrade, 35 miles west of La Grande, Oregon, has some of the most changeable and severe weather conditions in the Northwest. These conditions may impair visibility and cause icy road surfaces. You’ll lose about 2,000 feet of elevation in six miles and twist through a double hairpin turn at a 6-percent downgrade. On an average 78 percent of the Cabbage Hill crashes involve out-of-state motor carriers!" I've written about Cabbage in the past, and although hills like these are challenging when driving a rig, they're also exciting. The scenery is usually unequaled, and the teeny element of danger makes you sit up a little bit straighter when you're behind the wheel. My current run across the southwest doesn't take me over any treacherous hills, and the most exciting thing to happen these days is the possibility of seeing a dust storm. Haboobs. Snore. I miss the passes, the Sisters, the Grapevine, and the Cabbage.